To celebrate the August 14th Blu-ray release of Steven Spielberg's horror classic, 'JAWS', Universal invited High-Def Digest to the Universal Studios backlot in Burbank, California to chat with the film's co-writer and production designer, the producer of a Blu-ray exclusive documentary, and a Universal executive who oversaw the film's 35mm restoration alongside Steven Spielberg himself. One of the most anticipated Blu-ray releases in the format's history, 'JAWS' is part of Universal's 100th Anniversay celebration, and is one of thirteen 2012 Blu-ray releases to receive a full film-resolution restoration (more on that in a minute). Interviews were conducted along the route of Universal's famous tram tour, so every five minutes, a new tram teaming with tourists pulled behind the four interview subjects and, to the screaming delight of everyone involved, the dock exploded in a roar of fire as a mechanical shark rose up to attack anyone with a camcorder. Simply put, it was a great atmosphere for interviews, but eight minutes with each man was far too short. First up, we have J. Michael Roddy, the producer of 'The Shark is Still Working'. This fan documentary premiered a few years ago, but appears here as a Blu-ray exclusive. The independently produced film, narrated by Chief Brody himself, took Mr. Roddy and his partners (James Gelet, Jake Gove, Erik Hollander, and Michael McCormack) years to complete. They are honored to be included on the Blu-ray. HDD: I've been reading about 'The Shark is Still Working' for many years. It was a pleasure to finally see it. How exciting is it for you, setting out to make a "fan documentary", to have it be an exclusive special feature on the 2012 'JAWS' Blu-ray Disc? J. MICHAEL RODDY: When the producers and I set out to make this documentary, we wanted to make the ultimate fan documentary. That's why we did it. We wanted it to be for the fans, from the fans. And, you know, it's interesting that's become its own genre now. We really kinda started that ball rolling and it took a long time to get here [7 years!]. The road here had many potholes like the original 'JAWS', which took a long time to get to the theatre after many trials and tribulations. We are so absolutely thrilled to now be a part of the Blu-ray and it now gives us, a small part in our minds, we're part of the 'JAWS' mythology. HDD: Take us back to the beginning. How did you guys go from fans to documentary filmmakers? JMR: It's interesting. We were all inspired by 'JAWS'. It was our favorite film. And we were in different areas of the country, working in different aspects of production. We had the opportunity to interview some of the locals on Martha's Vineyard and realized there were really compelling stories we had never heard before. So as we started to capture that, we realized no one was really talking about the impact. We all know the shark didn't work, but the reason we named our documentary 'The Shark is Still Working' is because the shark not working then means the shark still works 35 years later. So as we really started to define what that could be, the impact, and talking about the legacy of the film, we realized there were so many people positively influenced by this film: shark researchers, conservationists and, most importantly, some of our most amazing filmmakers working today -- Brian Singer, Robert Rodriguez, Stephen Soderbergh, Kevin Smith. They all cited 'JAWS' as the film that made them do what they do. And we said, that's a great story, and everything else fell into place. HDD: Your documentary covers the huge challenges faced during the film's production. What was the biggest obstacle in making your film? JMR: The biggest challenge to making 'The Shark is Still Working' is that it was independently produced by five guys that live in different areas of the country, who pooled their own resources together and just had the passion to tell the story. What kept us going is the fact that we were doing it for the fans and we were also doing it for the people who gave us the time -- Roy Schieder, Richard Dreyfuss, Steven Spielberg, Joe Alves, Carl Gottlieb. Every time we had an opportunity to speak with one of those guys, it became another weight of responsibility that became "we have to see this through to the finish line". And the fact that it's now part of the Blu-ray, which is amazing, just gives us...it's such a great end. HDD: What was the timeline for making the film? How did it go from a discussion ("Hey let's make this documentary") to the final cut? JMR: We would pool our money together and have interview trips. The Internet was our friend. We had a grassroots campaign and we had a website to let people know what we were doing. And what was amazing is that most of the movie websites that are out there really picked up on it and supported us. So we started getting contacted, saying "well you know I have this piece of information about 'JAWS'" or "my cousin was this person that was in 'JAWS'" or "he knows this person." It was just making the calls to say "this is what we want to do, do you want to be a part of it?" And everybody said yes. HDD: What was it like meeting Spielberg for the first time? JMR: Meeting Steven Spielberg was, by far, the coolest experience of this whole documentary production. The cool thing about it is he's just a film geek like us. He sat down and he loves to talk about it. He lives and breathes it. The enthusiasm he had for our film, which is more about the film's impact, he was like a kid in a candy store. He was fantastic. HDD: When did Universal first talk to you guys about being on the Blu-ray? JMR: We always hoped it would be part of some type of release. 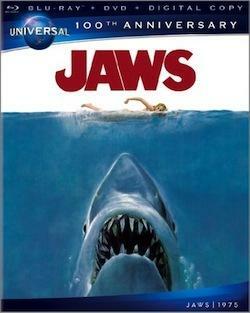 Like all the fans out there, when Blu-rays first came out, we were waiting for 'JAWS'. When's 'JAWS' going to be announced...when's 'JAWS' going to be announced? Probably late last year, Spielberg announced he was working on the restoration and, within a day, we got a call from Universal saying, "you know, you guys have bided your time, we really want your documentary to be a part of this amazing release. HDD: Awesome! So what would you say is the rarest footage you found, or something audiences may never have seen before, or something you learned that you didn't know about the making of 'JAWS'? JMR: Some of the rare footage and photos we have in the documentary have never been seen before. One of the coolest things about it is, as we started to talk to people, when 'JAWS' was made in 1974, there wasn't the security around a film like there is today. There wasn't the Internet so no one was nervous if someone took a picture. And we found all these people that had amazing photos and access to the set. Then we found 8MM footage of them making 'JAWS'. It's the highlight of the documentary for us because you get to see views of the shark where you can pick out what scene it is, but it's a different angle. Also, there are scenes like where the old man at the beginning of the film is complaining about the kids karate chopping his white picket fences. Well, they shot that scene and we have footage of them shooting it, and it's like, I never knew they shot that. That's amazing. HDD: What making-of documentaries inspired you guys to make this film? JMR: Our mark for this was we wanted this to be a companion to the Laurent Beuzerau 'The Making of JAWS' [also on the Blu-ray]. That is a fantastic documentary. The reason most of us originally bought laserdisc players is for that documentary. HDD: How many times has Universal restored 'JAWS' in the last 37 years? MIKE DARUTY: I believe this is probably the third time. We probably originally did it for VHS, and we would have redone it for DVD, and now for Blu-ray. HDD: What was the condition of the source materials? MD: We accessed the original 35mm negative for this restoration, which is the first time we've ever done that [for 'JAWS']. The negative was in a condition that's typical for its age and use. We scanned that original negative in 4K on a liquid gate scanner. The liquid gate helped with some of the surface scratches. Then we went through our normal processes of color correction and digital restoration -- removing scratches and repairing torn frames. There were a scene or two that had some film damage. We process all of that, bringing Steven in a couple times during the process to get his feedback and final approval, and then we output it, in this case a new 35mm negative so we could preserve it as well as make some prints. We also made a new 2K digital cinema version and then new Blu-ray HD elements. HDD: From the 4K or 2K master? MD: Everything was done in 4K. HDD: Were there any surprises? MD: We had never gone from the original negative before. Our prior transfers were from the 35mm interpositive, so the difference is the interpositive is a [color] timed element that goes through a wet gate process. The original negative is untimed, so it takes a lot more color timing. It's not a wet gate, even though we scanned it as a wet gate. It still has a lot of normal negative dirt and scratches and, in this case, a couple torn frames. So the challenge was color correcting it and matching shots captured on different days or at different times of day. Then it was about going in and just cleaning it up. And it looks better now that it's ever looked. HDD: Is there anything in the movie, after the 4K master was complete, you noticed new that you've never seen before? MD: I think just detail. There's much greater detail in this version because it's a much higher resolution. HDD: How many films are you restoring for Universal's 100th Anniversary? MD: As part of the centennial, we've restored thirteen titles on a full-film restoration basis, which is really unprecedented for any studio to restore that many titles in a one year period. It really demonstrates our commitment to our preserving our library. We've also done remastering on another twenty-thirty titles for Blu-ray. Some of those are titles for the 'Alfred Hitchcock Masterpiece Collection' and others. But these thirteen titles were all done on a film resolution basis. We've released some already, more that are our classic horror movies will be released in the Halloween timeframe and we also have some of Hitchcock's films as well. HDD: How does 'Vertigo' look? MD: 'Vertigo' will look great. You'll be excited to see it. HDD: What are some of your favorite restorations? MD: I think, as part of this year's thirteen, we worked on some classic titles. 'All Quiet on the Western Front' was a massive restoration. 'To Kill A Mockingbird' was, again one of our classic titles, and the restoration on that was fantastic. The ones we're doing, our black & whites, are using original source materials from the '30s. When you're dealing with those things, sometimes you're searching for different elements due to damage. Every restoration is unique. They're all challenging, but it's extremely satisfying to have the opportunity to work on these. 'Out of Africa', 'Buck Privates', 'The Sting' -- they're all a great opportunity for us to be custodians to keep those for future generations. And we'll continue to keep an on-going preservation and restoration effort. HDD: Do you have a favorite Blu-ray? MD: 'JAWS' is fantastic, but I truly like the restoration work we did on 'To Kill A Mockingbird'. Part of it is, I know what we went through to get there, so when I look at something in the end, I'm a little jaded because I know how difficult, or not, it was. But I think 'To Kill A Mockinbird' looks fantastic. JOEL ALVES: "Did you know it was going to be such a big movie?" Nobody ever knows if it's going to be such a big movie, but we had confidence in the film that it would be a good movie, but you'd never know we'd still be talking about it 40 years later. HDD: When you took the job, did you know how big a challenge it would end up being? JA: I started on the movie very early. Before it was even a script. Spielberg and I were friends; we worked together before. And I just did concept sketches based on the book. It just sorta grew, you know, it's gonna be this big shark. Steven didn't want to use miniatures, and of course we didn't have CGI. We were gonna do a full-sized shark in the real ocean. It was a very, how should I say, naive in a way? So in this naivete, it created a problem which they said couldn't be done. I found somebody that could build [the shark]. He said he needed time, but we didn't have that. So it grew. We didn't understand the complexity of it. Working on the ocean is so unpredictable. It could be calm or it could be horrendous. So yeah, you have no idea when you take something like this. HDD: Are there any "easter eggs" for fans to find while watching the Blu-ray, in terms of in-jokes for friends and family names on stores and shops? Things you built into the universe for fun? JA: You know, I can't think, offhand, of anything like that. Once we got going, there was so much focus on the shark being in the right location, dealing with the people on the island, and the script was being written as I was storyboarding. It was a work in progress. HDD: Did you have to change Martha's Vineyard very much to create Amity Island? JA: I scouted all over the east coast. I met Peter Benchley in New York, and we went up to Long Island, Nantucket, Martha's Vineyard, all over Cape [Cod], Marblehead, Glouchester. Martha's Vineyard was so perfect -- the village, all the picket fences. I built Quint's shack. I added a couple things, signs and stuff, a bicycle shop. But basically it was pretty much there. HDD: Tell me about building Quint's shack. It's filled with wonderful props that create a rich backstory. JA: Well that was John Dwyer [Set Decorator]. I had worked with John on 'Night Gallery'. Both of us didn't have a lot of feature experience, but we came up through the studio system. I was a set designer, assistant art director. I worked with Hitchcock. It was just training. So you learn how to find that stuff. I designed the shack, and John was out looking for all that stuff. We built a whale, a killer whale. And all those jaws-teeth, that was studio system experience. HDD: For The Orca itself, you had two of those for production? JA: Yes, we bought the boat in Boston and totally reconfigured it. Rob Mattey [special effects] designed one that could sink and come back. But The Orca, the real one, it did sink a little bit because we would anchor it with these I-bolts so the boat was filling with water and they had to race it to shallows and then they repaired it. It got a little dicey for the crew. HDD: What was something you learned on 'JAWS' that you used on the sequels? JA: Obviously I learned we needed more preparation with the shark. It worked better [in the later films], but the studio had more influence than on the first film. So they thought "we needed more shark stuff". On 'JAWS 2', I directed 100 days of second unit, so we shot more shark stuff that we didn't use. It went on-and-on for thirteen months in Florida because what I learned was Martha's Vineyard was perfect for the look of the island, but not for shooting. Short season. Too cold. Water had too many boats in the summer. So we went down to Pennsicola, Florida. It was desolate there. Beautiful, white sandy beaches. The water was perfect. Temperature was warmer. I learned more preparation is needed. HDD: You worked with Steven Spielberg on his first three theatrical motion pictures. How did your relationship grow and how did he grow as a filmmaker in the time you spent together? And what was your favorite set that you built? JA: Well, the biggest set was for 'Close Encounters of the Third Kind'. That was the biggest set, at that time, ever built inside. I designed the set and they wanted to put it at Columbia, but even two stages together wasn't big enough. Se we found an airplane hangar in Mobile, Alabama. So that was the biggest. As for Steven, he just grew more confident. He was always confident, always steadfast in what he wanted, and I never had any problems with Steven. We probably would have worked on a few more projects, but I was approached to work on 'JAWS 2' and he didn't have a project ready at the time, so we sorta just split off. HDD: Is it true that the hangar set, for 'Close Encounters', had its own weather, that it rained indoors? JA: Yeah, it was so vast and the humidity was incredible. HDD: How did you get involved as a writer? What shape was the script in at that time [Peter Benchley wrote the first three drafts]? And where did you then take it? CARL GOTTLIEB: Well, I was friends with Steven. We knew each other socially. I acted in a couple of his television movies. He said "it would be great if you came on this movie as an actor. You'd be on the set, out on location. And you could punch up the dialog and work with crowds" because I was an improvisational comedian at the time. So I said okay and he sent me the script with a note in it saying: eviscerate it. So I read it and the script that I got was a rather conventional guys-in-jeopardy kind of story based fairly faithfully on the novel, which was a big bestseller. The best example for how the script was is the studio's casting notions: Charlton Heston as Quint and Jan Michael Vincent as Hooper. And that speaks to a different kind of movie. Wooden characters that were more symbols than human. And my job was to take these characters and make them human. To make the characters on the page actually match the actors that we had, which is a great luxury for a writer to know for whom you're writing. In that regard, the greatest challenge was cutting away the superfluous and concentrating on the story with believable characters who behaved in human terms and human ways that were not cartoon heroes and villains. So that was the challenge. HDD: Was all your work done on set, or did you complete a draft prior to production? HDD: How much shark was originally in the script versus what was shot while reshaping the script mid-production? CG: I'd actually have to go back and look at previous drafts, but I don't know. Once the shark wasn't working, we had to figure out a way to maintain the presence of the shark without actually having to show it, except for a fin or trail, etc. So that lead to crafting a really good horror story with a delayed entrance for the villain. Steven and I were both aware of an old black & white film called 'The Thing'. John Carpenter remade it, but in the original, it takes a long time for the creature to appear and you're terrified for the first half of the movie because you don't see the creature. We said we can do this; we don't have the creature, but we can make it horrifying and terrifying with a slight-off-screen presence appearing as if it were on screen. So the challenge was trying to find new things for the shark to do. This resulted in the opening scene which sets the tone, the two guys at the dock, the attack at the beach. Theses were all deliberately done to create the horror without showing the beast. HDD: What's a favorite moment from 'JAWS' that you argued passionately for and helped create that made it to the final film? CG: I love the scene, it's right after they find the floating head [00:50:23]. Spielberg shot it as a great, long take. Hooper and Brody are arguing with the Mayor, and over the long take it's a wide shot and a two shot and it reveals the sign. And in that dialog where Hooper's very passionate, you learn everything you need to know about sharks. You're instructing the audience, but what they're focusing on is "hey this guy really wants something and because of this stupid Mayor people are going to die." It's all there in the dialog and shot in a way that respects the dialog. That's a favorite moment. And let me tell you another one -- the runup to the Indianapolis speech [01:26:26]. They're supposedly in the safe haven of the cabin having dinner, it's nighttime and they've had a couple drinks. They're comparing scars. That's a moment of male bonding that was a pleasure to write and a pleasure to see the actors do. There we have it, Dear Readers. A big THANK YOU to Universal Home Entertainment for a chance to meet the filmmakers and restoration experts behind this incredible Blu-ray. At 37 years old, 'JAWS' looks and sounds brand new in sparkling 1080p and a full 7.1 DTS-HD MA surround sound mix (purists will enjoy the DTS 2.0 Mono track). The Blu-ray package is a two-disc edition (one BD, on DVD), which instructions to access both UltraViolet streaming and an iTunes compatible Digital Copy download. Many of the bonus features you know and love are included, plus the new Blu-ray exclusive, 'The Shark is Still Working'. I had read about the documentary for years, but never saw it. Though it's not in HD (or even formatted to fit 16x9 HDTVs), it's a treat for any 'JAWS' fan. Hit up the forums to share your thoughts and personal 'JAWS' stories.